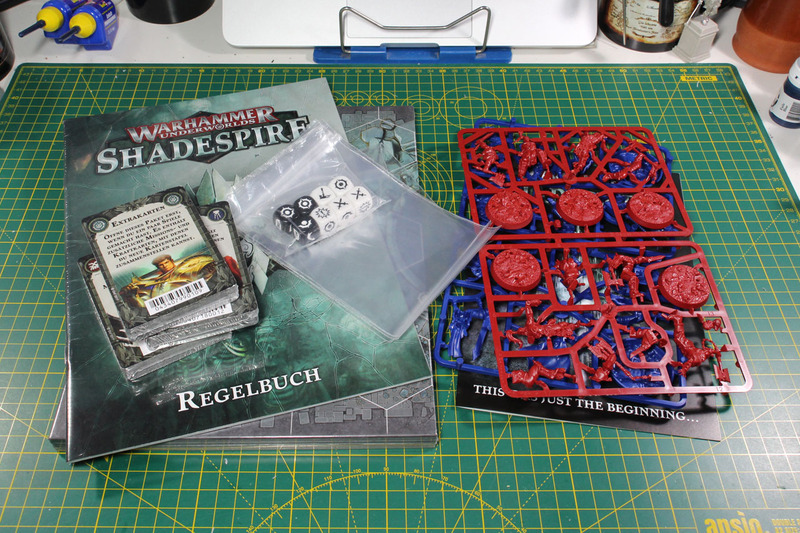 Just before the next edition of Age of Sigmar will be released, I want to take a closer look in this review on one of the "introduction" games to the Warhammer World, Warhammer Underworlds: Shadespire. 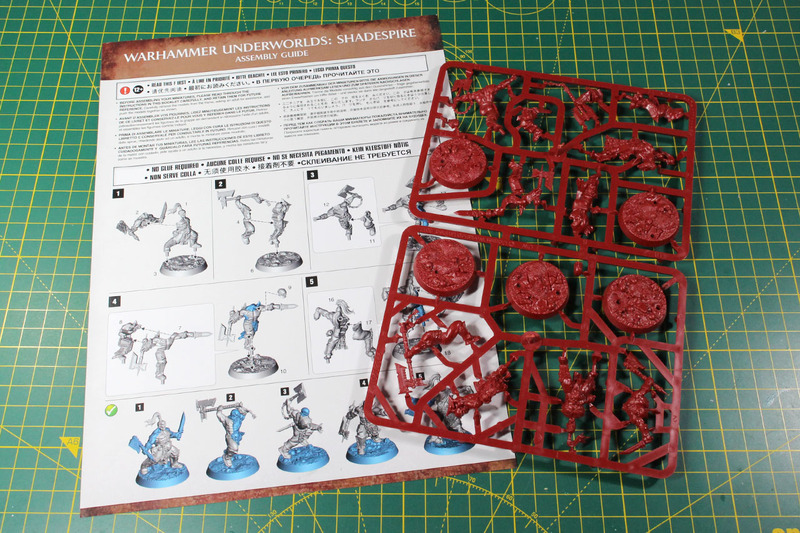 Games Workshop released Warhammer Underworlds: Shadespire last year in 2017, as a tactical miniature board game, at a lower entry point, much smaller in size and number of miniatures as for example Warhammer Quest: Silvertower. 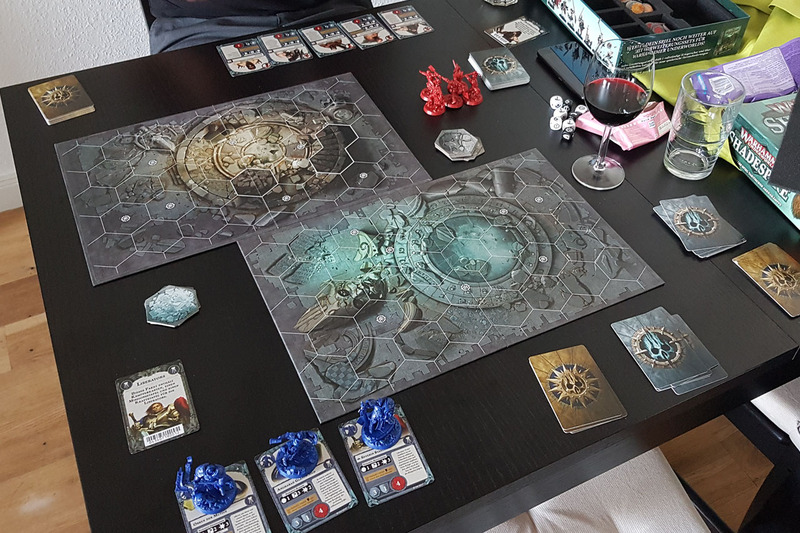 Shadespire is played in an ancient and damned city, between the realms of Light and Shadow, in the new post-Old World Warhammer Setting, as an "arena game" using two hex field boards with matches taking around 30-45 minutes. 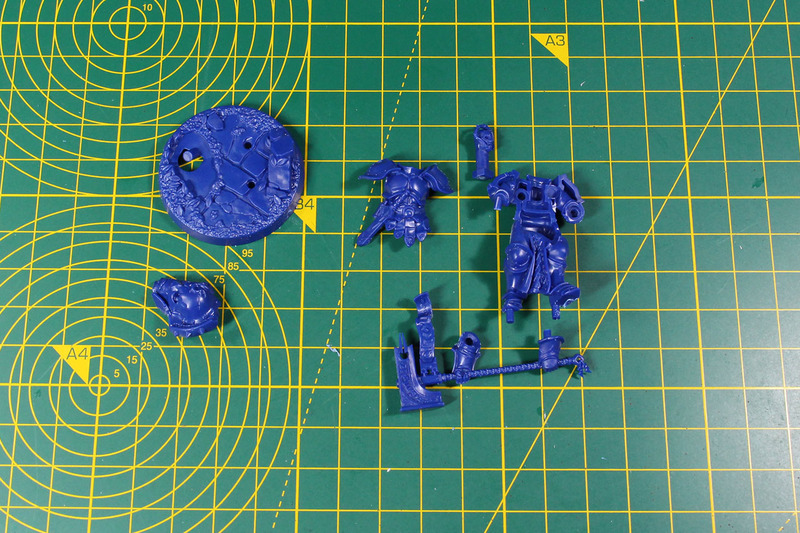 Everything you need for your games is included, with the push fit (means no glue needed) pre-colored plastic models and you only need a cutter to prepare the game. From the background, or fluff, point of view, what is Warhammer Underworlds: Shadespire about? 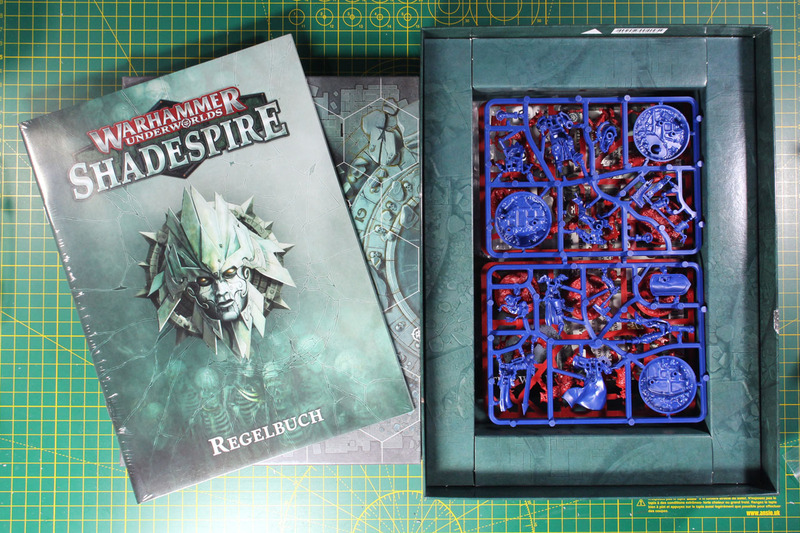 Shadespire is a city cursed by Nagash, and trapped in a limbo between the Realm of Shadows (Ulgu) and the Realm of Light (Hysh). So the Mirrored City, how Shadespire is called as well, is the destination for many adventurers and their attempts to escape the eternal curse. There are 6 factions fighting skirmishes in the ruins, Stormcasts, the followers of Khorne, Orruks, Fyreslayer Duardins, Deathrattle Undead, and Skaven. Each with their own motivation, may it be the treasures, the bloodshed or simply enforcing Nagash's will. 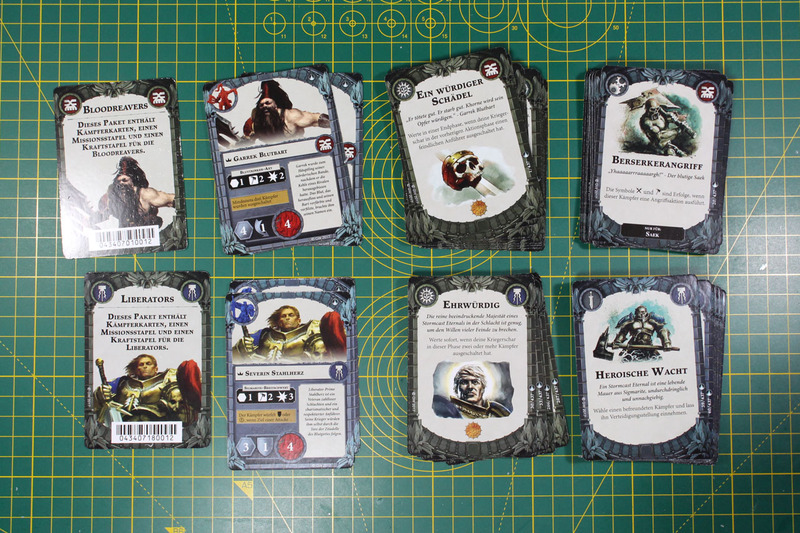 Why are these introduction games so important for Games Workshop? 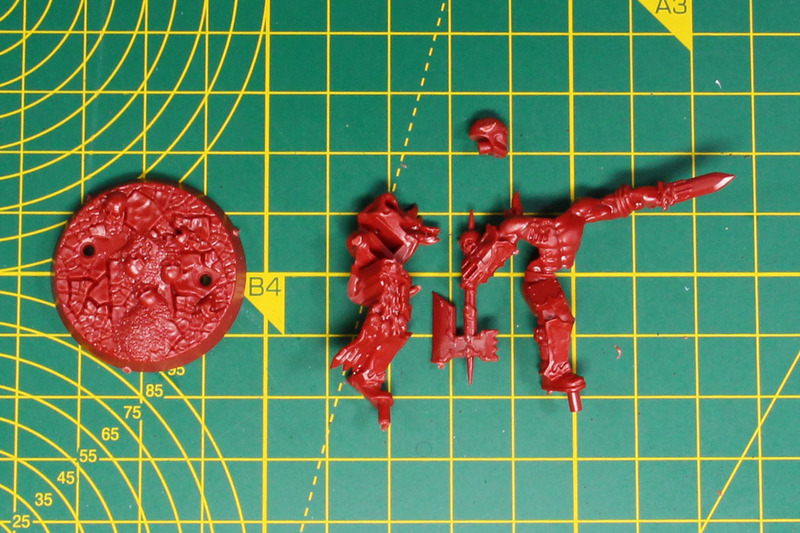 Wargaming is a niche hobby, even for a multi-million Pound company like Games Workshop. Of course, nowadays with social media like Facebook and Youtube, it is easier to get the word out there. 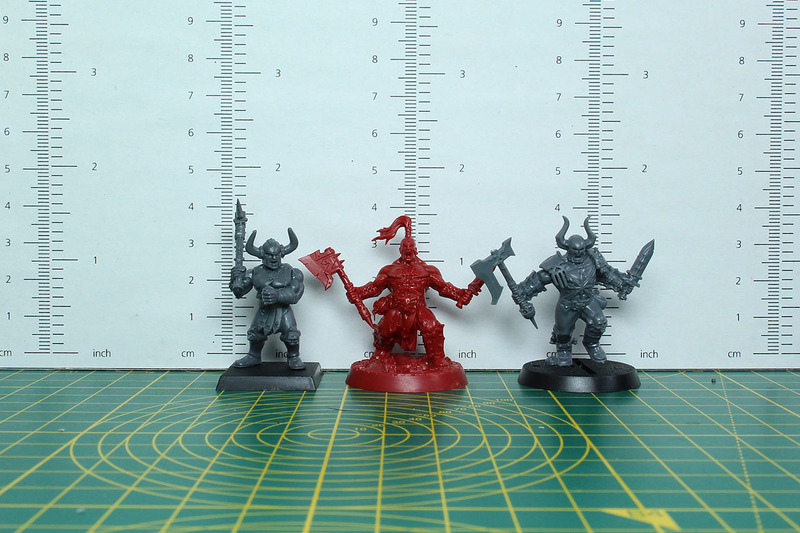 But back in the 1990s, games like Heroquest or Space Hulk, that were sold in regular toy stores and not just fantasy or comic book stores, were for many people their first contact with miniature based games. But in addition to the longer reach of these miniature board games (in comparison with "real" tabletop wargames), they are closed systems. What does closed system mean in this context? If you play a board game, usually everything you need is included in the box it comes with, there is maybe an expansion or two, but that's it. 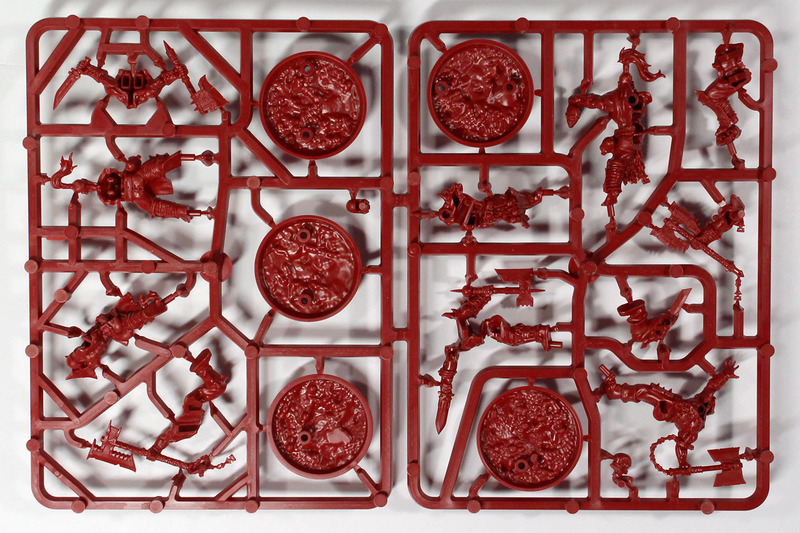 As with wargames, you have starter sets, additional rule books, you need to assemble the miniatures and paint them, you need space and terrain for game and so on. So the barrier to enter is much lower for a game like Shadespire compared to Age of Sigmar. This is a product / game that gives newcomers as well as veterans a way to get and keep in touch with their wargaming. 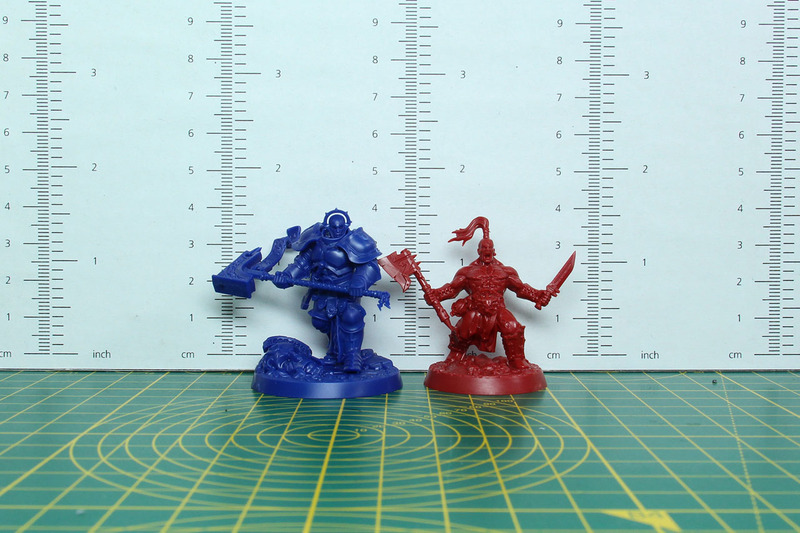 For a newcomer it is an easy to manage number of miniatures, so you can see if miniature gaming is for you, without a larger invest on miniatures, paint and terrain. For older gamers, or the ones with less time, a game like this still gives you a miniature based game, without the trouble of large space and longer matches. So if you don't have that much time on your hand, but still want to participate, this is one way to go. 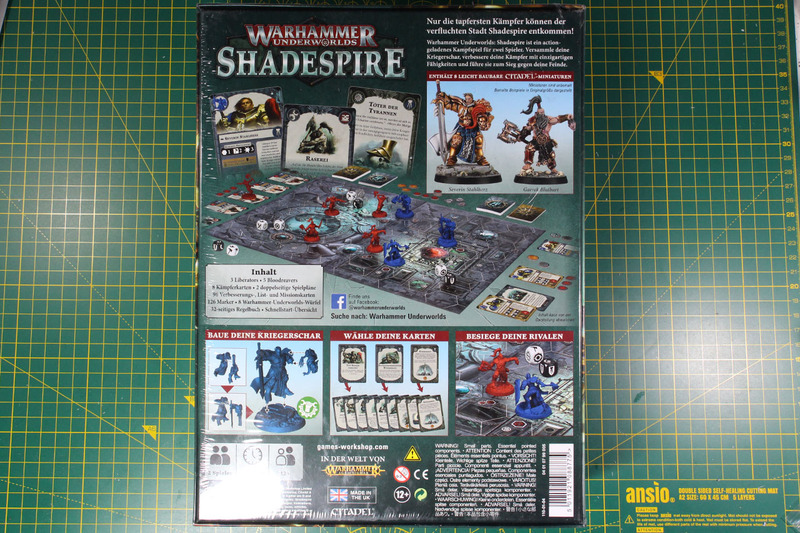 Beside the look and feel, that I'll cover further below, at first I thought of Shadespire as one of the board based side games, and expected a simple skirmish. An easy, casual game, to get started. 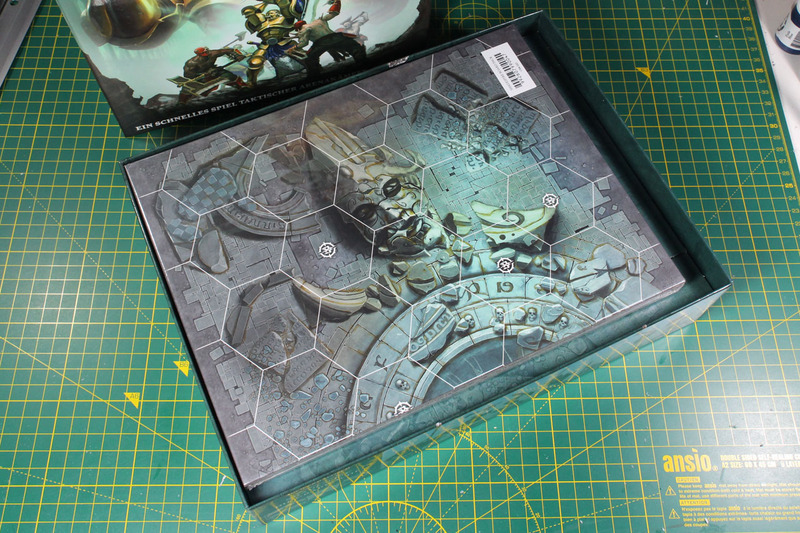 But after I received some very enthusiastic feedback from players, who usually go with hard competitive games like Warmachine or Guildball, I had to take a closer look. Shadespire has a tactical depth that I wouldn't have expected at first, and the high rating on Boardgame Geek (if you're not familiar with this, that's like IMDB for board games) proof them right. But more on that later under how plays Shadespire. The game has a very high quality feel to it. 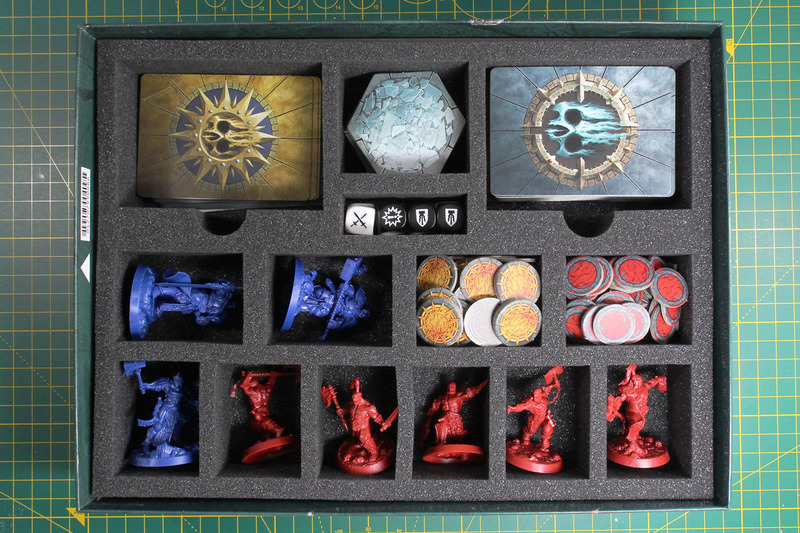 Beginning with a box, token and hex board made from thick cardboard, along with properly printed cards and quality casted dice and miniatures. 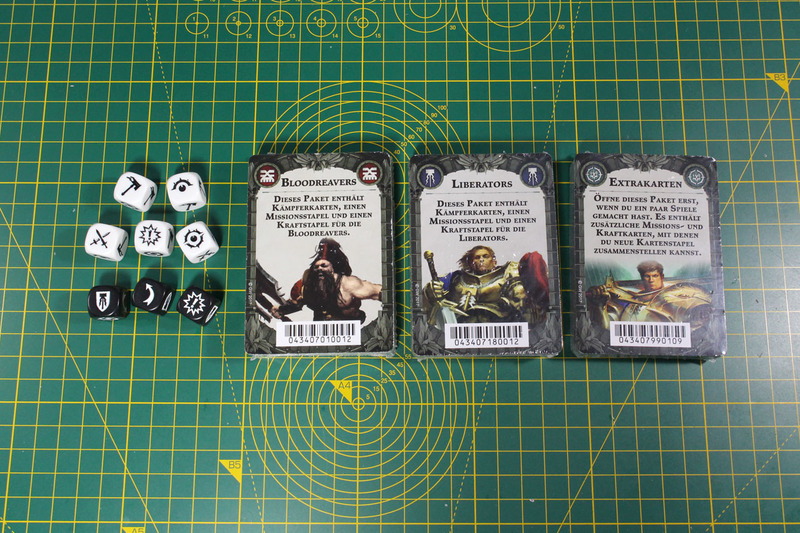 There are 8 dice, 5 white attack dice and 3 black defend dice, and three card decks (one for each faction, and an additional deck with more cards to be used after the first couple of games). The two game tiles are double sided (with different motives) and have 5 by 8 hex fields, along with half hex fields on the edges that are completed by aligning them with a second game tile. You can see the game tiles in action further below. 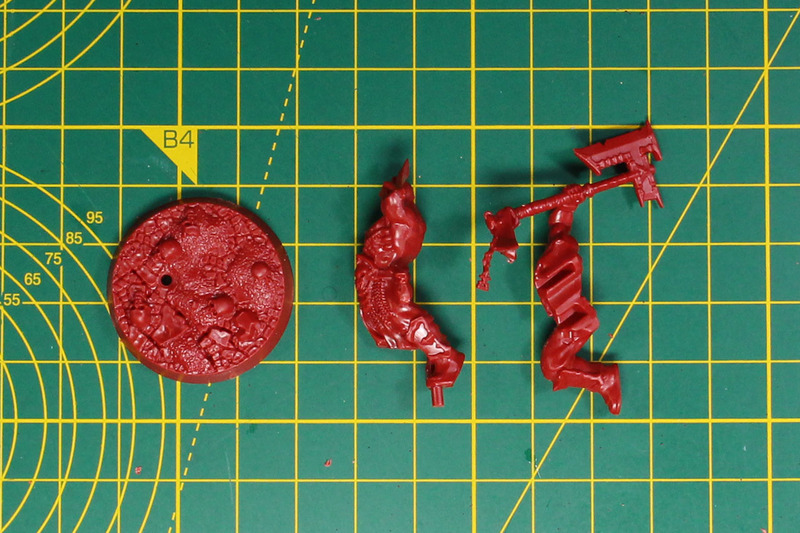 There are plenty of tokens as well, to keep track of wounds, activations and movements, mission markers and glory points. 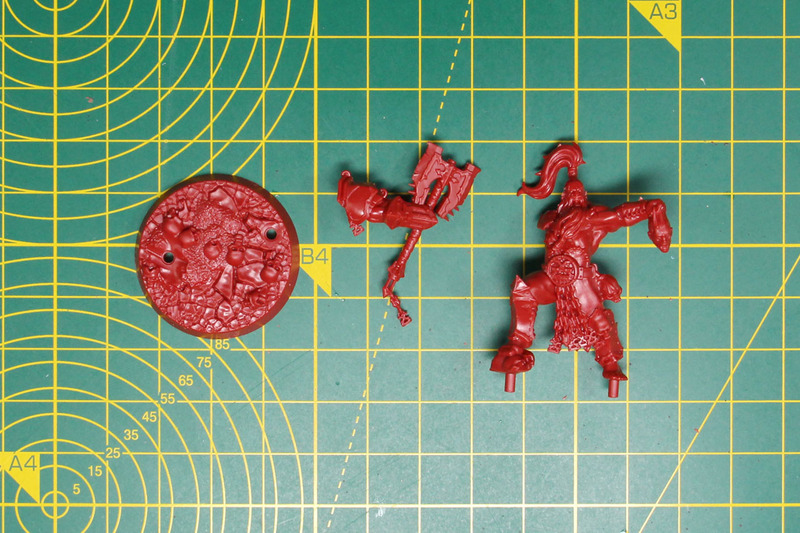 The two warbands included in the game, Garrek's Reavers and Steelheart’s Champions, are casted in red and blue, so they can be easily identified prior to painting. The casting is very well done and crisp. 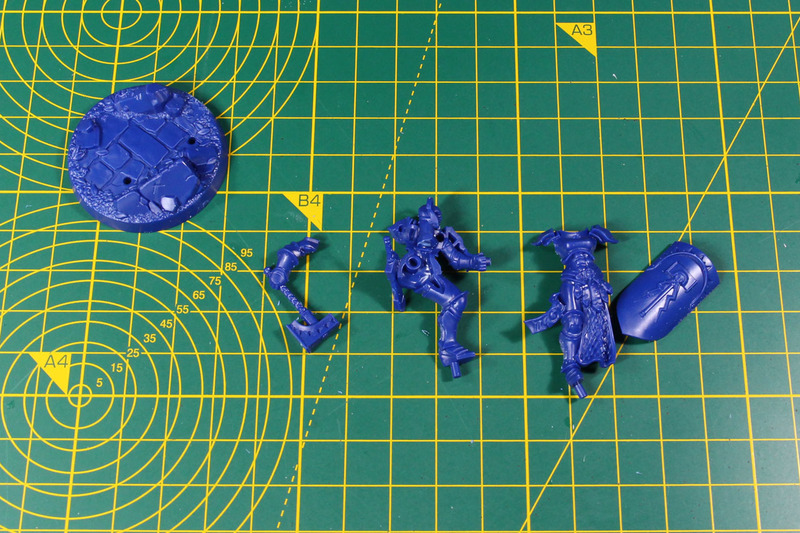 All of the miniatures are push fit, so you do not need glue to assemble them. 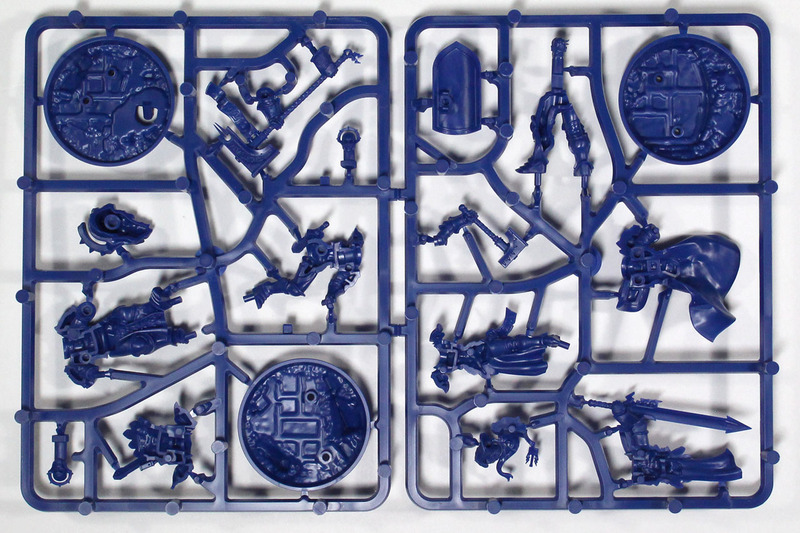 Just a hobby knife or a pair of pliers to get the parts out of the sprue and a knife or file to clean of the few mold lines. 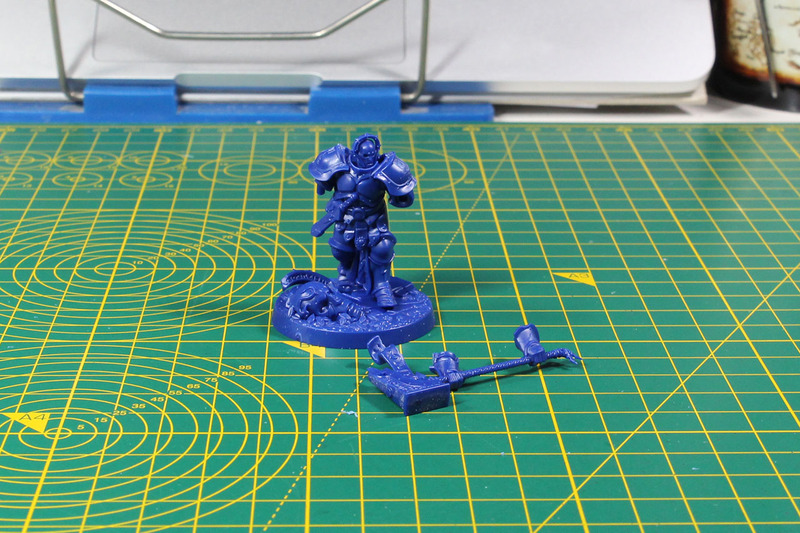 The material is the same as the grey hard plastic, can be glued with your regular plastic glue and painted the same way as your other miniatures. 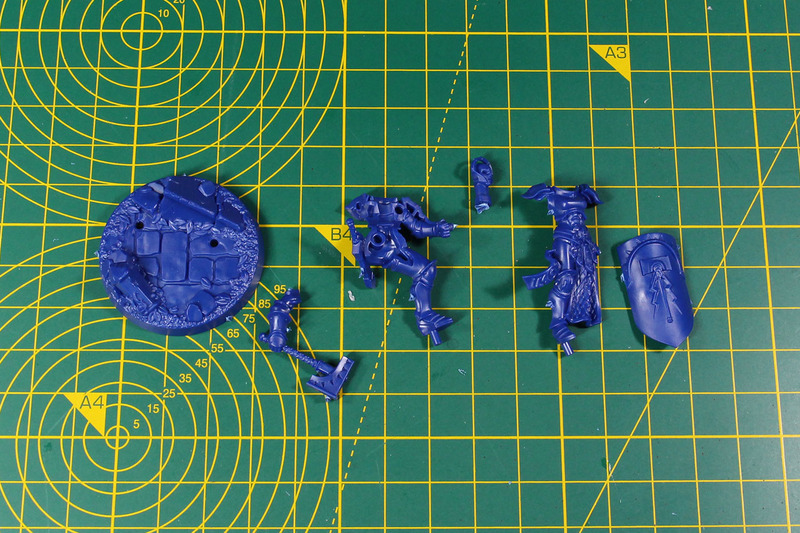 If you have the feel, that the material is a bit glossy, give it a brief wash in lukewarm soap water to remove any remaining release agent on the sprues. 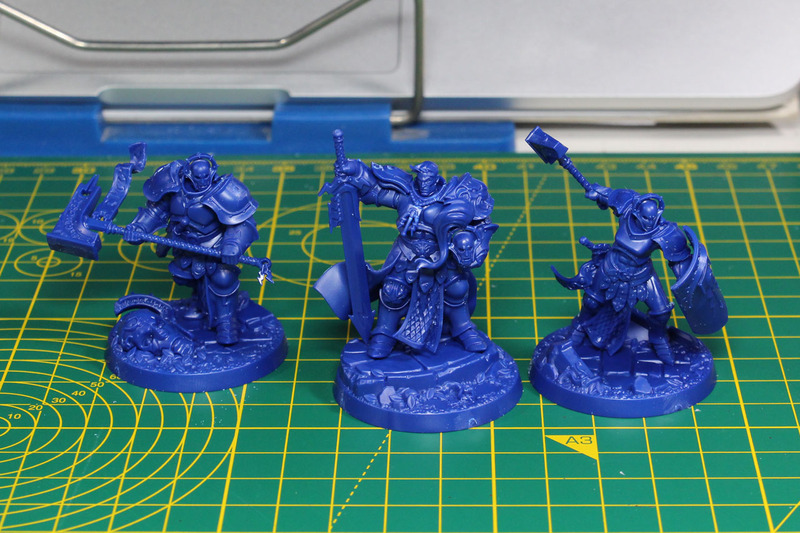 Let us begin the assembly with Steelheart's Champions, a warband of Stormcast Eternals. 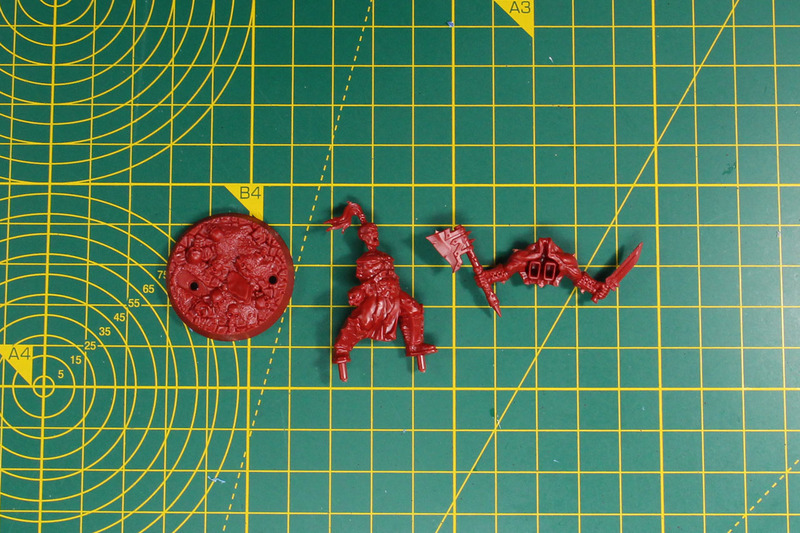 There is an instruction for both of the warbands and they are rapidly build. 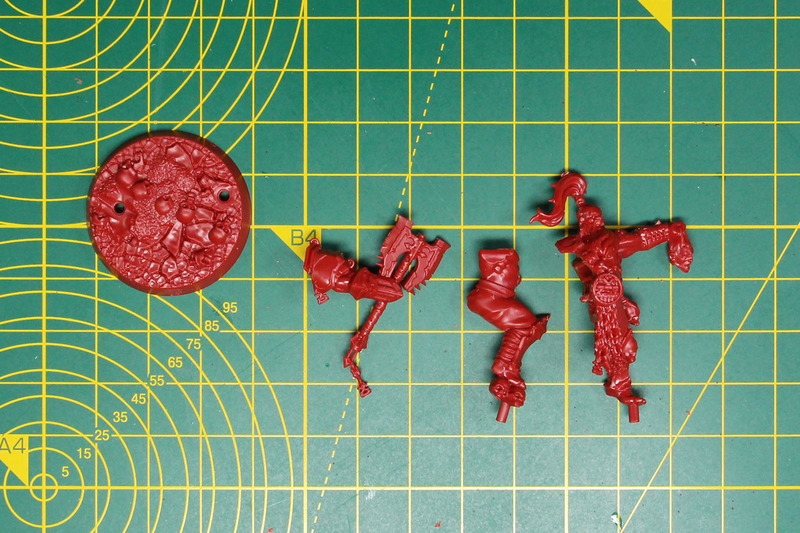 All of the miniatures have modelled bases, so you just have to paint them (and maybe at a bit of flock), but everything else is taken care of. 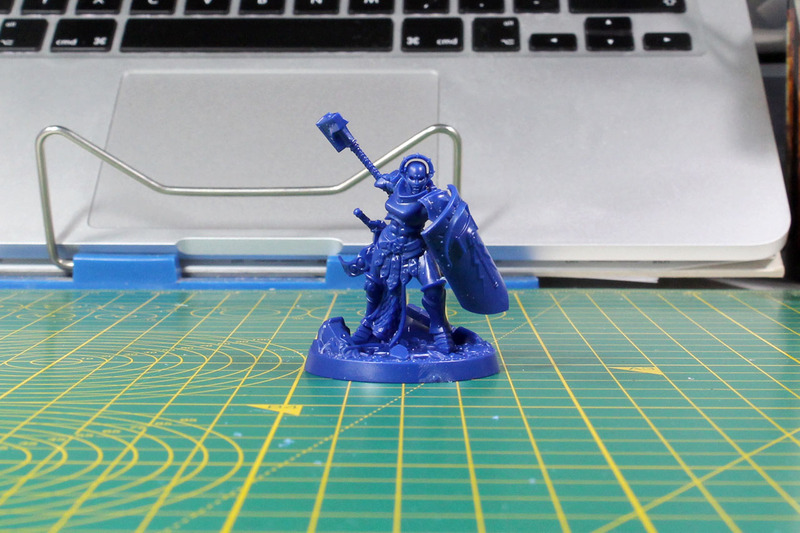 First off, Severin Steelheart, the leader of his warband, wielding a huge broad sword and carrying his helmet in his left arm. 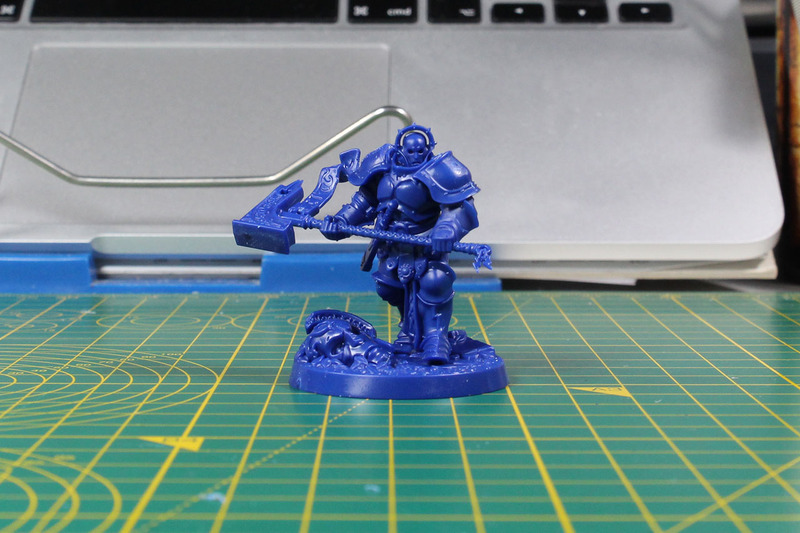 Obryn the bold, reforged for the third time, carries a grandhammer and belongs to the unit of Liberators from the Stormcast Eternals. The third warrior of the warband is Angharad Brightshield, a female Stormcast, using a warhammer and sigmarite shield in battle. 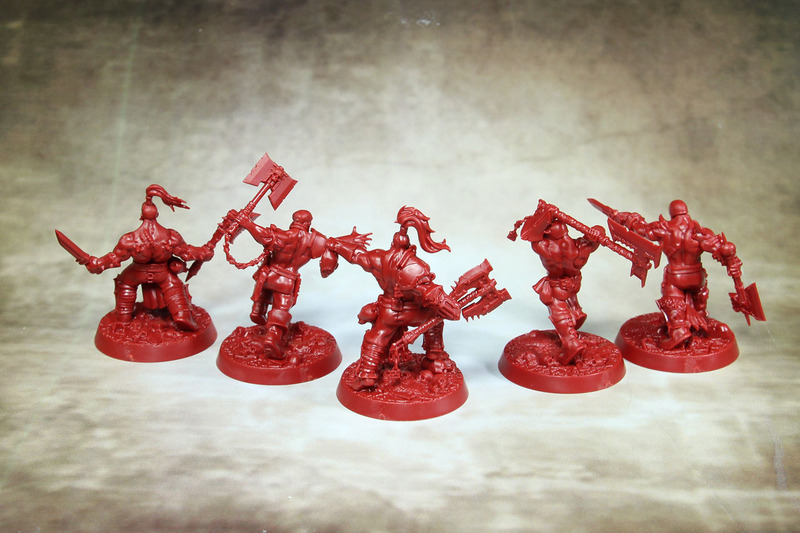 The second warband in Shadespire, are Garrek's Reavers, a warband of the Khorne Bloodbound. 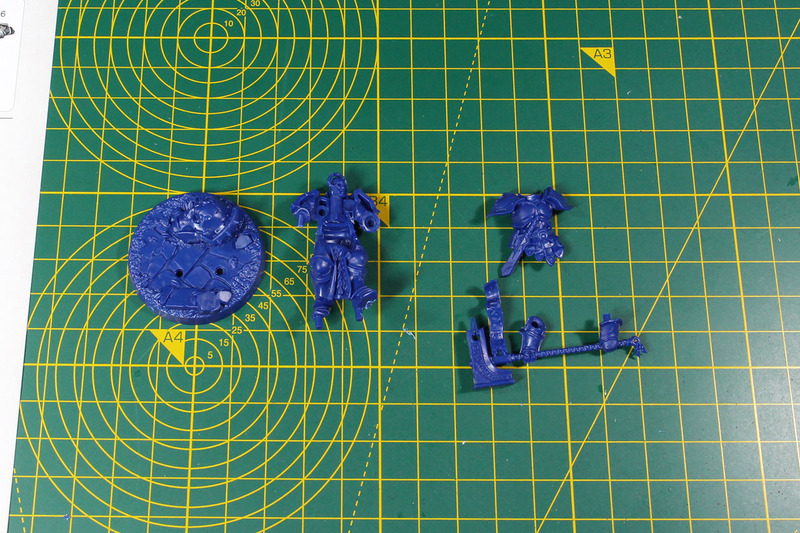 They have modelled bases as well and are a unit of five. 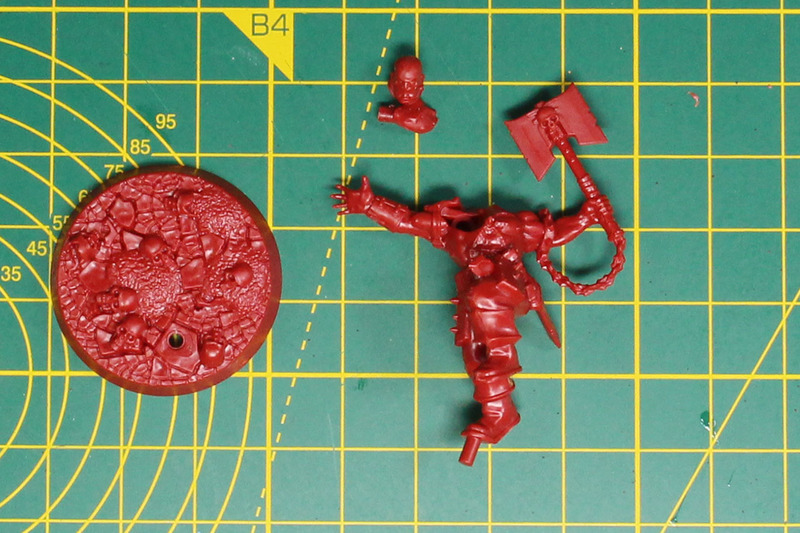 The leader of the Khorne followers is Garrek Gorebeard, carrying a Blooddrinker Axe and the severed head of an unlucky enemy. Targor and Arnulf are both double wielding reaver blades (a mixture of hand weapons, in this case axes and daggers). Karsus the Chained has a chained axe (yeah, well...), which counts as a ranged weapon. The last of the quintet is blooded Saek using the Meatripper Axe in battle. 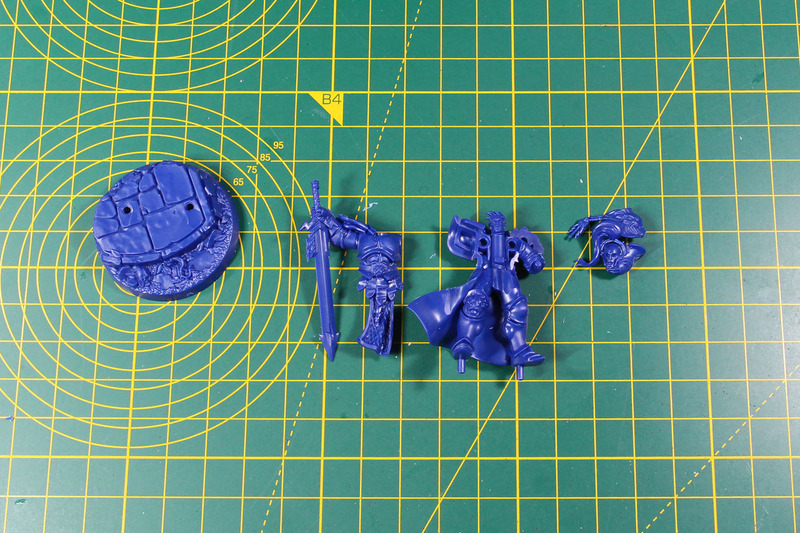 The fit of the miniatures is quite good, only Saek had a minor gap on his chest and back, that will need to be taken care of with a bit of plastic glue or liquid green stuff. 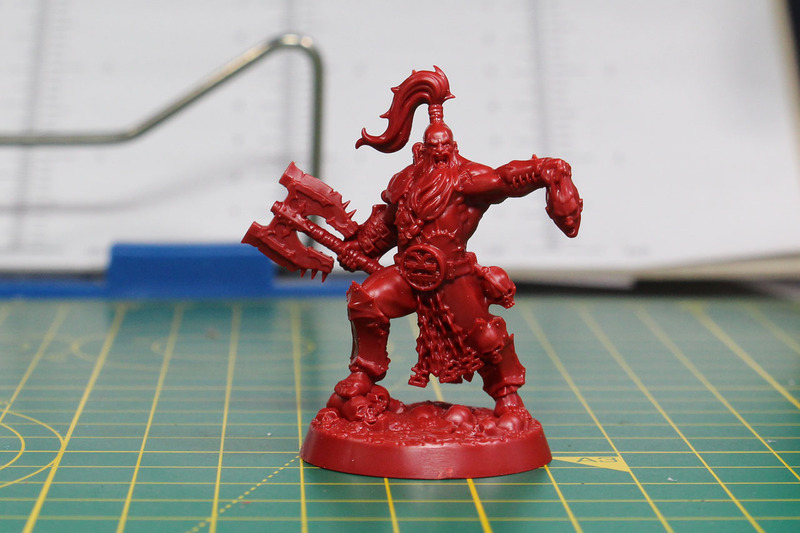 How plays Warhammer Underworlds: Shadespire? 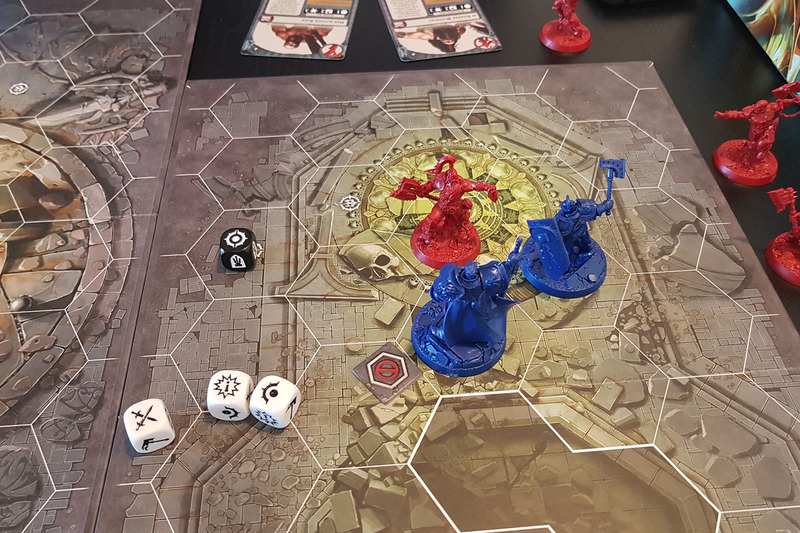 The best way to learn Shadespire, is to play it. 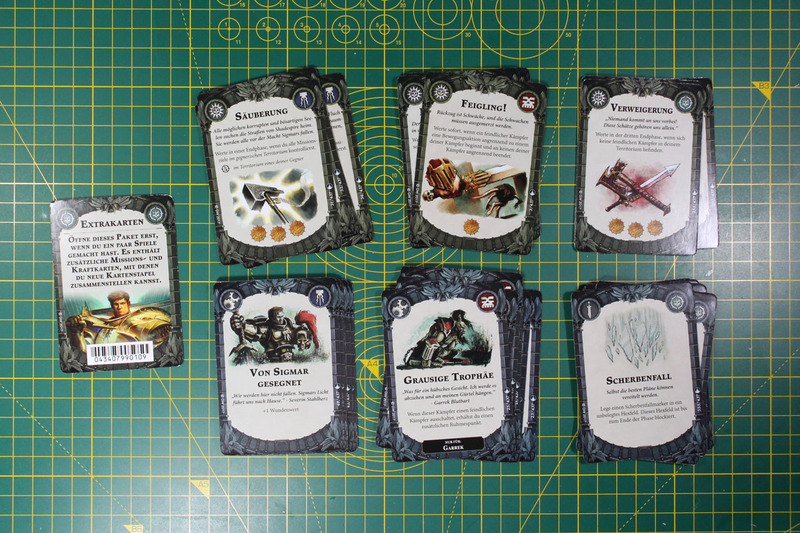 The game provides an introduction sheet, which covers the basic rules and helps to understand the stats on the character cards and the mechanics of attacking and defending. I have to say, the battle reminds me of a combination of Heroquest and Blood Bowl. 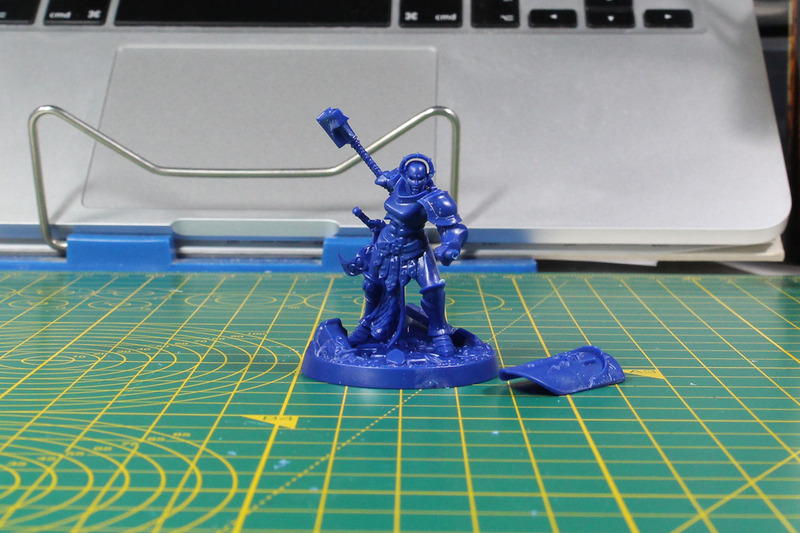 The dice consider the type of weapon and defense equipment, as well as supporting characters on both sides. And as you have a visual result on your dice, it is (or at least feels) easier and faster than regular dice with boni and mali. 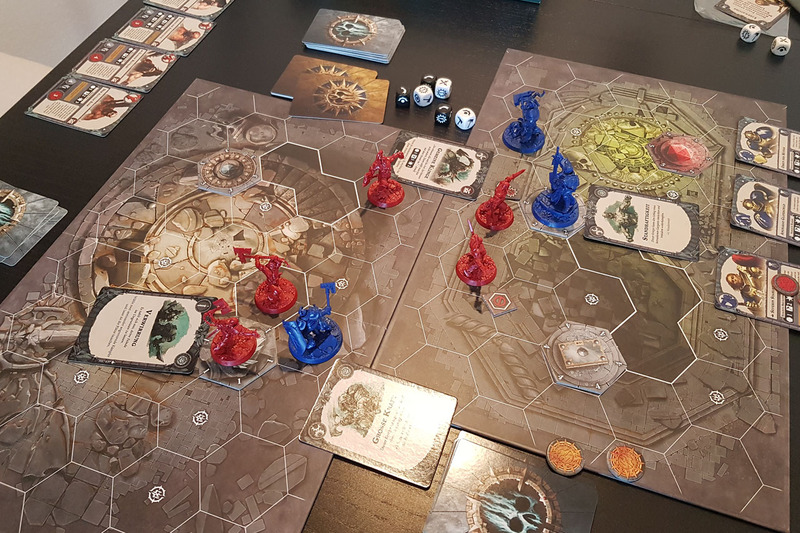 Each game of Shadespire is only 3 turns, each with an action and end phase, keeping it fast paced and concentrated. Each turn you have four activations that can be used to either move, attack, go into defending stance or to do a special action from his character or upgrade card. 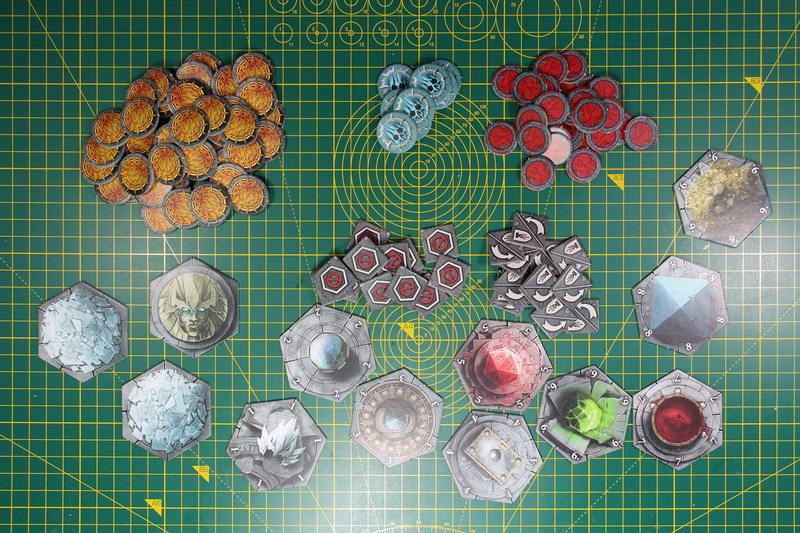 Moving is straight forward, you move the miniature as many fields as you like within the movement stat noted on his character card. An attack is similar, you get to role an amount of dice, depending on your weapon / equipment and the attacked character defense using his stats / gear. Comparison of hits, damage is dealt and if the damage is higher than the amount of remaining wounds, the character is out. Those actions benefit from upgrades (cards for example that modify your dice results, deal damage to multiple enemies, etc. ), so it is important to keep an eye on your deck and the possible synergies that you can activate by achieving the mission goals and gathering glory points. In addition characters receive boni when they are motivated. Each character has different conditions for being motivated, for example being wounded, or a certain number of enemies were slain. 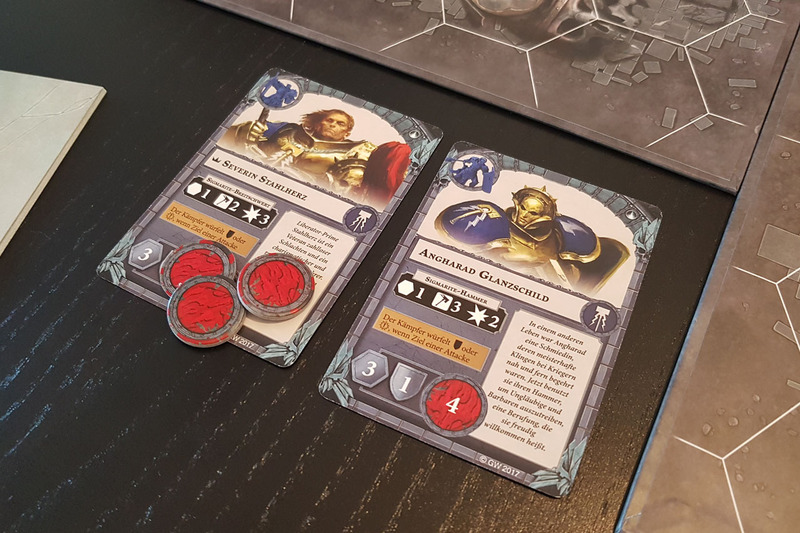 Shadespire has asymetric mission goals that are assigned by drawing cards. The mission goals can be chosen during your deck building, so that they match your play style. Aligning your goals with the strengths of your warband, helps you gather glory points fast and effective, so you can spend these on upgrades for your characters. This gives the game an interesting twist, as it brings motivation beyond the simple arena death match and just annihilation of the enemy warband. Some missions are easier to achieve for some warbands as to others. 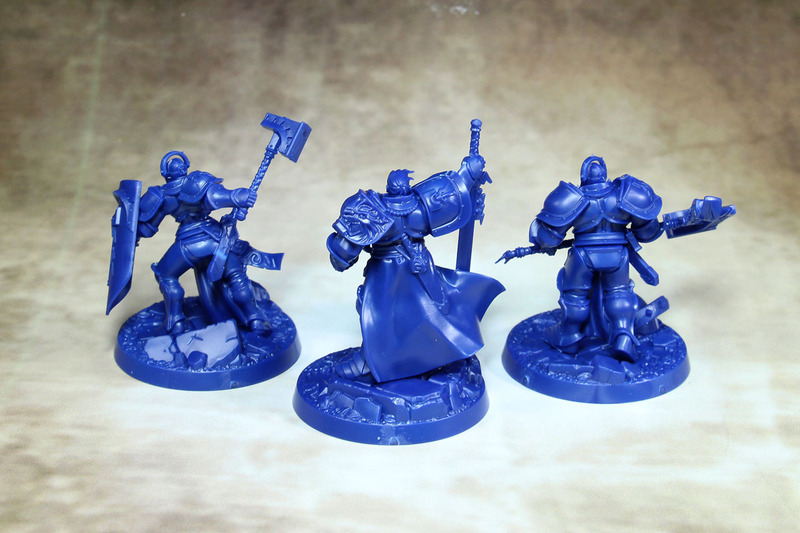 The stern Stormcast for example are better at defending mission markers, but the greater number of warriors (and higher movement values) of the Bloodbound makes it easier for them to collect shards of shadeglass. After the first couple of games, we added the third deck of cards and tried a bit of deck building. It is very interesting to see, that you can modify your gameplay by adding / building your card deck to your like. The expansion sets cover specific cards for the warband, but generic cards that can be used for other warbands as well. This brings a card game aspect, like Magic the Gathering, to the game, but not in the random trading card game way, more like the living card games, we know from Fantasy Flight Games. Less gamble and clearer distribution / availability of the cards you're looking for. Another interesting aspect, that is more strategic than you might think, is the set-up of the boards. There are fixed rules, on how the two tiles connect, but they have a certain flexibility. You can leave a small gap, you can make the board a long narrow tunnel or broad arena. And depending on your play style, your mission goals and / or the strength of your warband, these setups give you benefits. 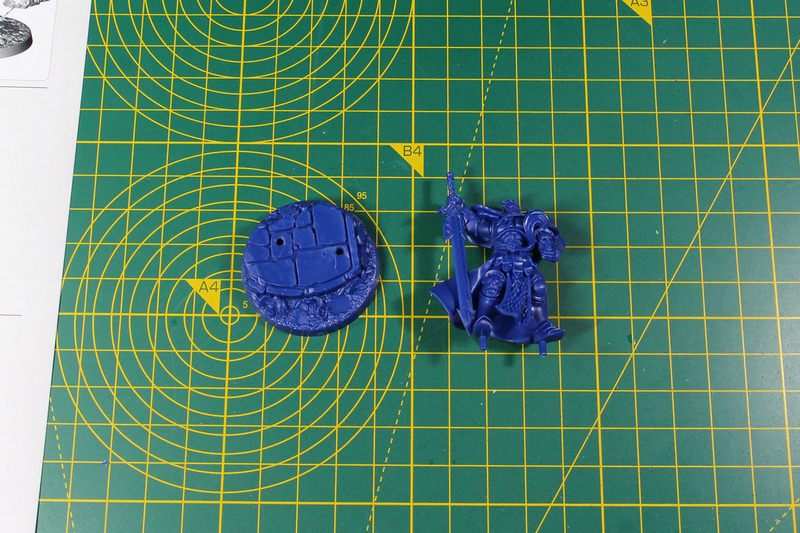 Especially if you have to defend a couple of mission markers, it is easier for the Stormcast to leave a narrow gap that you can close with your warriors. And Shadespire can be played with more than 2 players. It covers rules for 3 or 4 players in the set as well, but an additional starter set is useful to expand the board game from two tiles to 3 / 4. 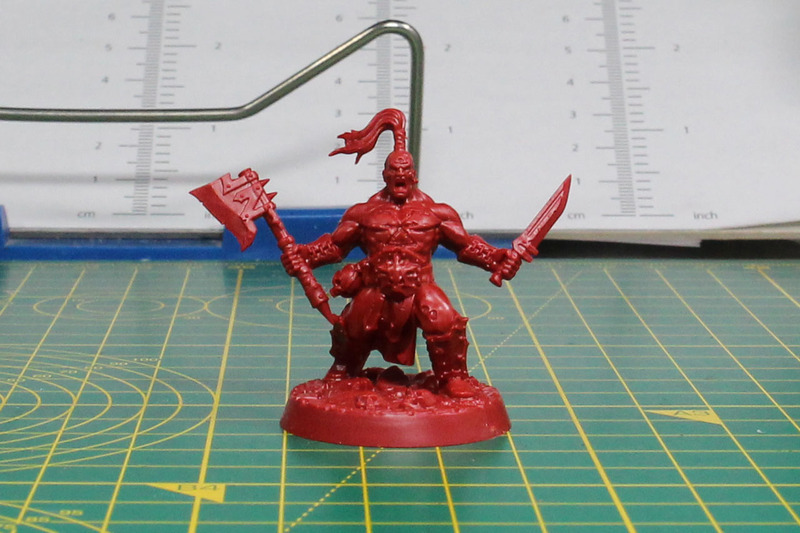 Warhammer Underworlds: Shadespire is a closed game as such, but there are a couple of expansions to extend your game experience. Until now the other 6 warbands, that were introduced in the starter box are released, those are another Stormcast warband, called Farstryders, sending Vanguard Hunters to the mirrored city, another Khorne Bloodbound warband Magore's Fiends, an undead warband of the Sepulchral Guard, an Orruk warband called Ironskull's Boyz, a band of Duardin Fyreslayers called the Chosen Axes and a Skaven pack called Spiteclaw’s Swarm. 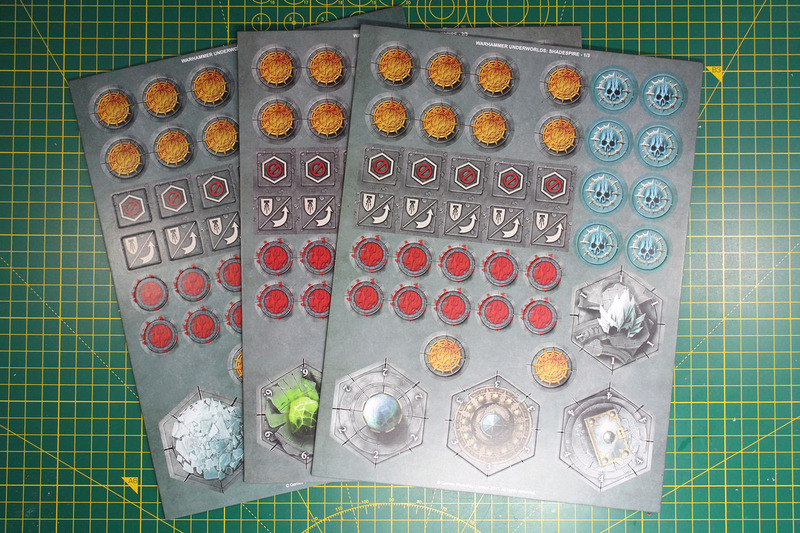 In addition to that, Games Workshop offers custom coloured dice for 6 of the warbands (blue for Stormcast, red for Bloodbound, green for Orruks, purple for the Undead, amber/brown for Skaven and orange for Fyreslayr, all defense dice are smoke) and 6 different packs of card sleeves (for everyone but the Fyreslayr and Skaven). 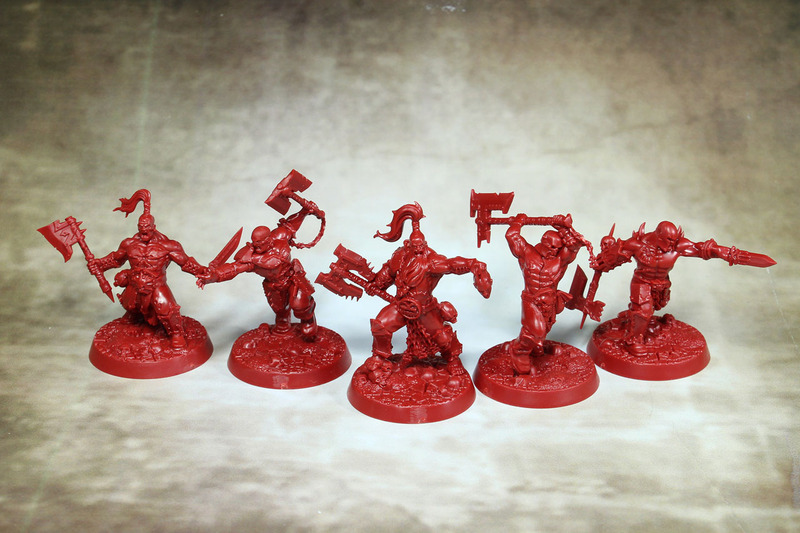 The dice for the Orruks and Undead seem to be currently sold out (at least online). 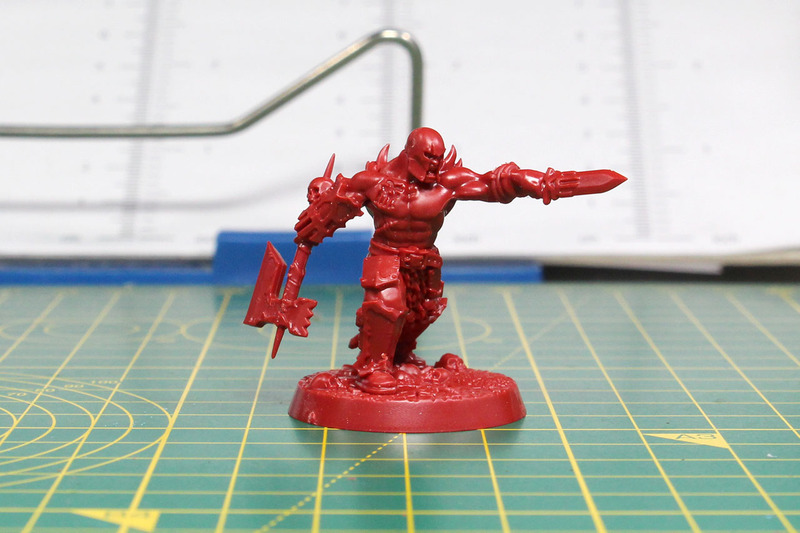 Games Workshop supports the game with massive content online, from the How to Paint videos on WarhammerTV, to How to play videos, deck builds on the Warhammer Underworld page, along with information on organized plays. And that is quite impressive, as half of this isn't available for the main range nor Sidekick / Specialist Games. There are third party products for the game as well. 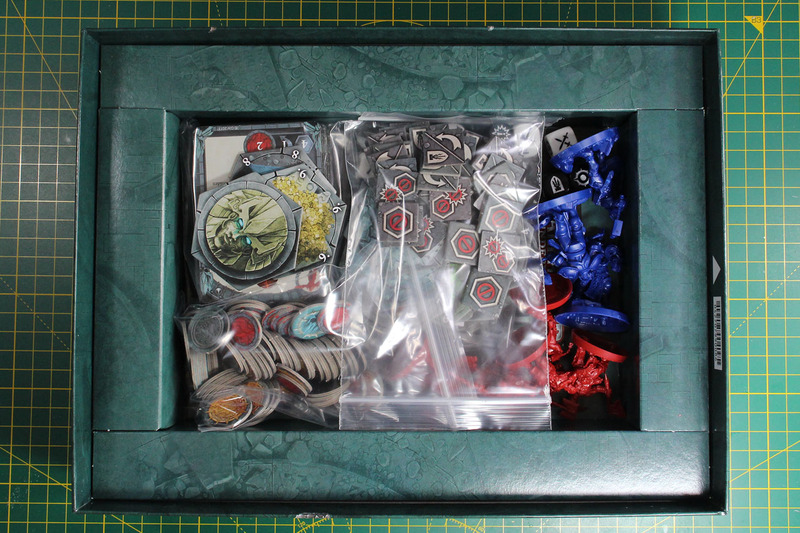 All the contents fit into the box after assembly nicely and there are bags to store the tokens, which is a good thing. 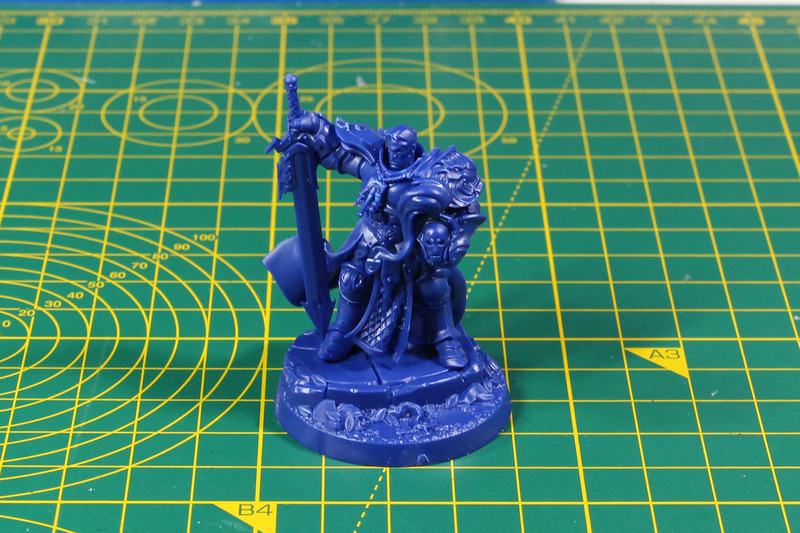 But I got myself a Feldheer inlay designed for the Shadespire starter kit, as I do not want the (painted) miniatures to be stored without proper protection. 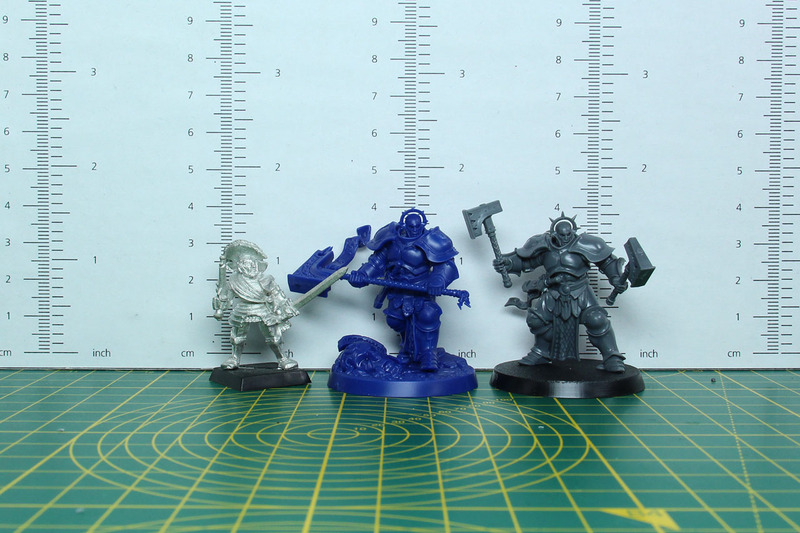 The miniatures are compatible with the regular Age of Sigmar range and were released within the last weeks as easy-to-build kits, without the cards / additional Shadespire content at a slightly reduced price. 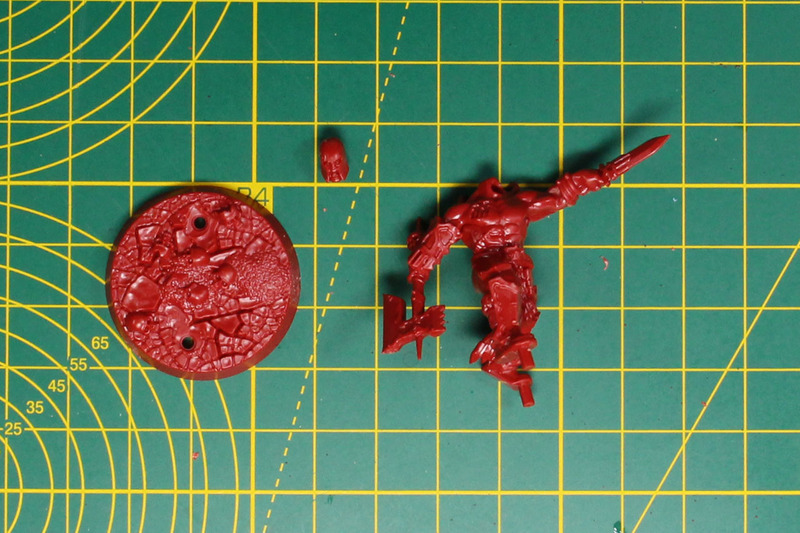 For scale comparison, a Stormcast next to a Blood Reaver. 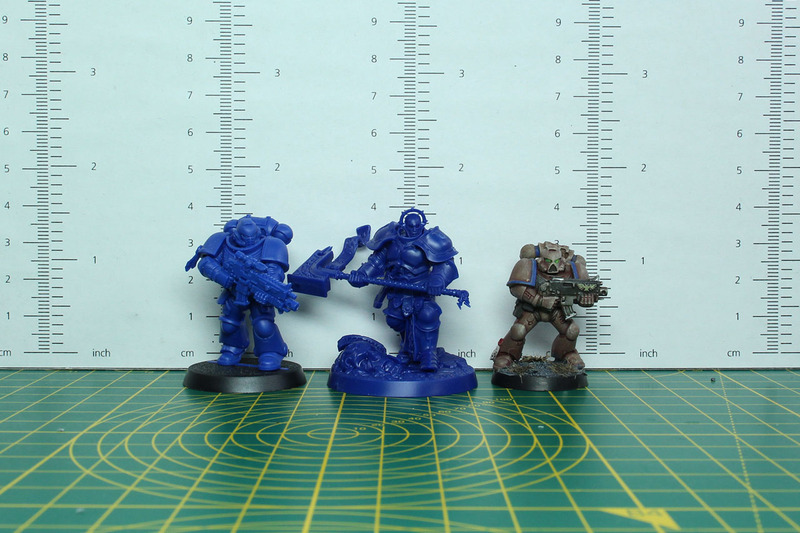 Those "Sigmarines" Stormcast are quite huge, as the comparison with a regular Space Marine and one of the new Primaris Space Marines shows. 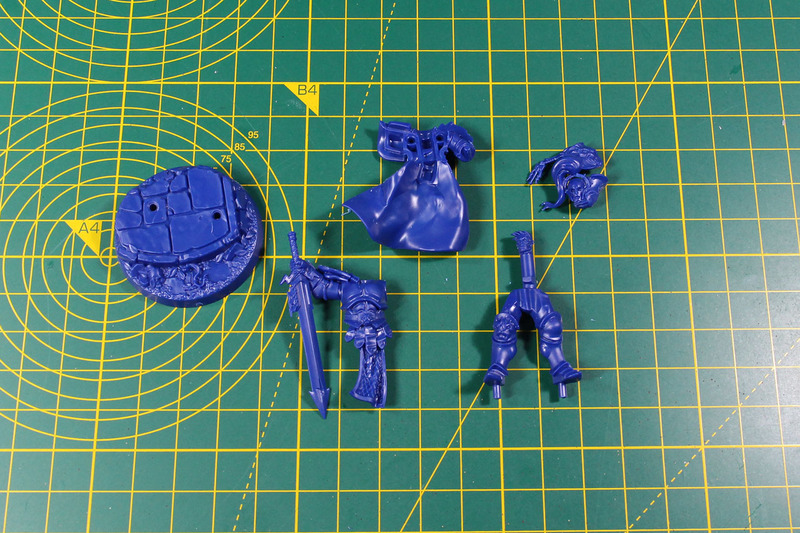 For comparison with other miniatures of the same faction from Warhammer Fantasy / Age of Sigmar, a human captain next to the Stormcast Eternal from Shadespire and a Stormcast Eternal from the Age of Sigmar starter kit. 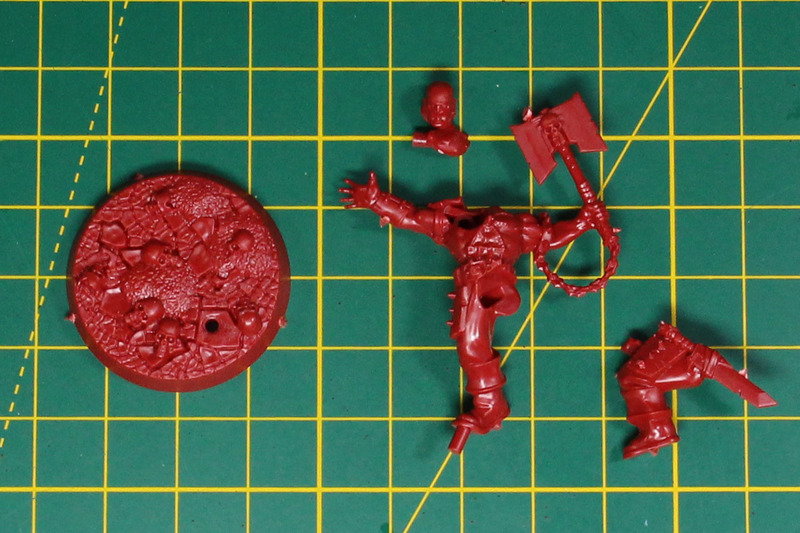 The second picture shows an old Chaos Marauder with the Shadespire Blood Reaver and a Blood Reaver from the Age of Sigmar starter kit. 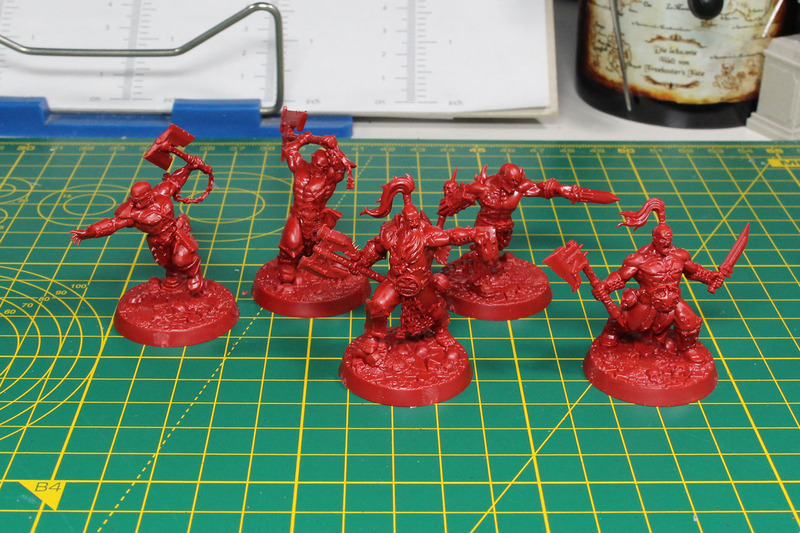 And the two warbands in their assembled glory. 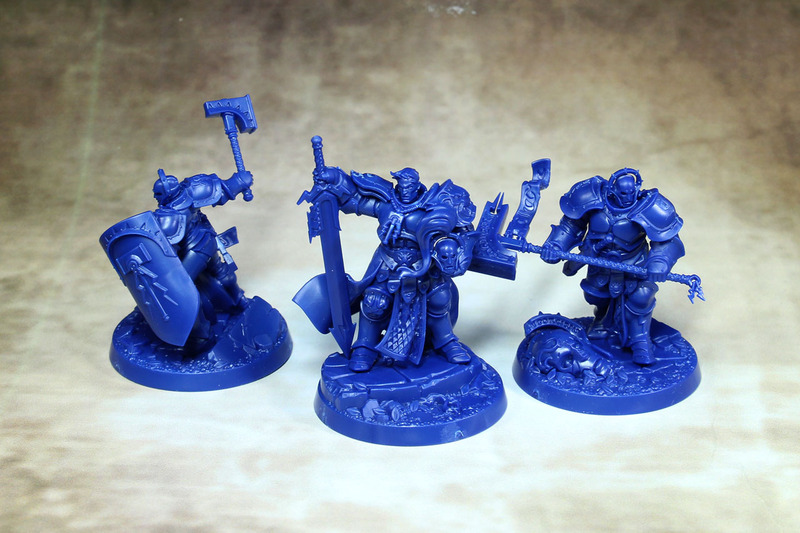 Shadespire is set at 40 GBP / 50 EUR, the expansion sets at 17,50 GBP / 22,50 EUR. As an arena board game it is very well done, both, quality and rule wise, and I am still amazed by the tactical and competitive possibilities of this game. 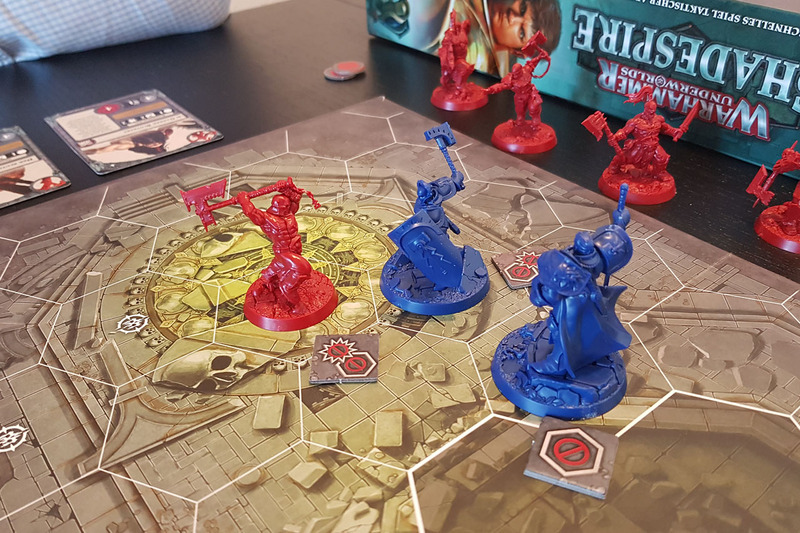 (Smaller) board games often battle with the problem of repetitive game play, but due to the many variations that Shadespire offers, it has a great re-play value. And if you add the expansions this factor is enlarged by multiple times. The full game costs you 145 GBP / 185 EUR, if you want to have all the warbands and cards. That is not cheap, but still a manageable amount of money. 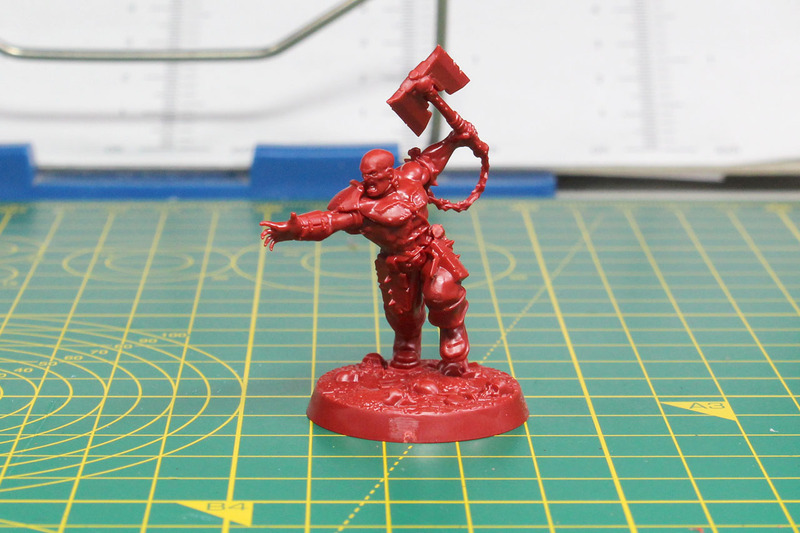 From a wargamer point of view, Shadespire might be something that you can suggest to a friend, who wants to try out miniature gaming, but doesn't want to split a larger starter box or commit to a larger project. 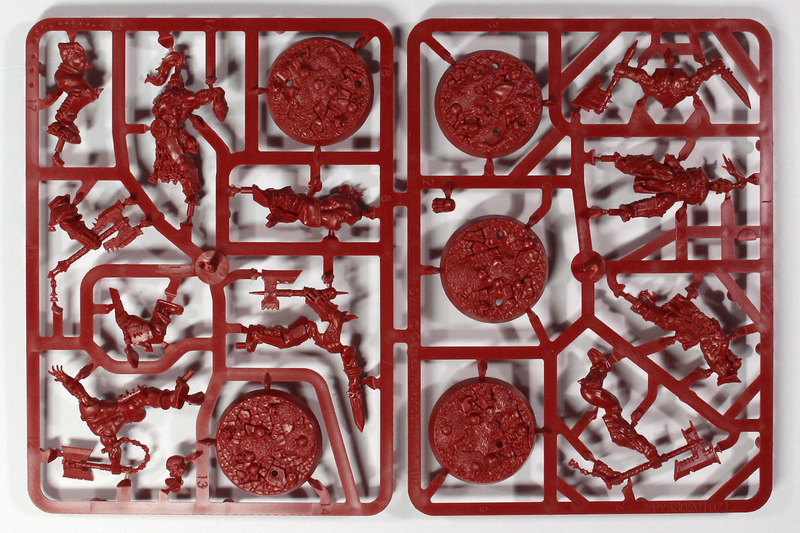 Let them choose a supplement warband or a starter kit of their own and have a few games. 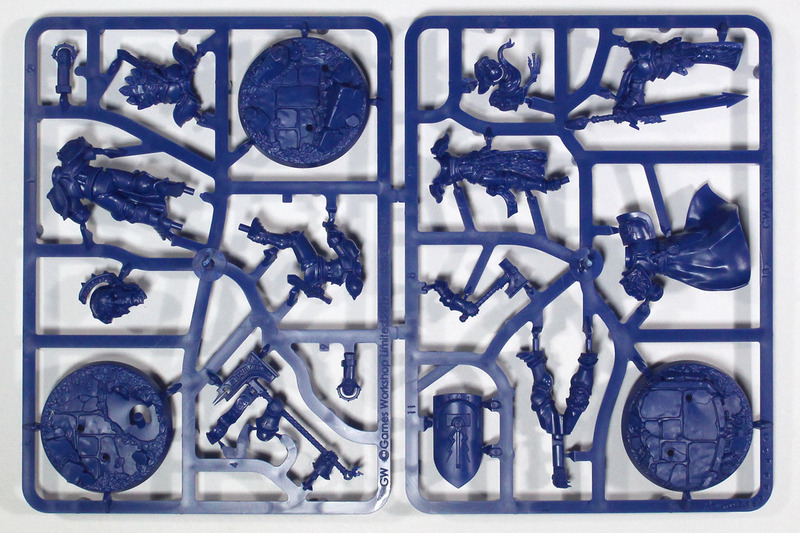 If their interest grows and they want to start with the skirmish or Age of Sigmar, add a start collecting! box to your warband and you're pretty set up for some smaller games. 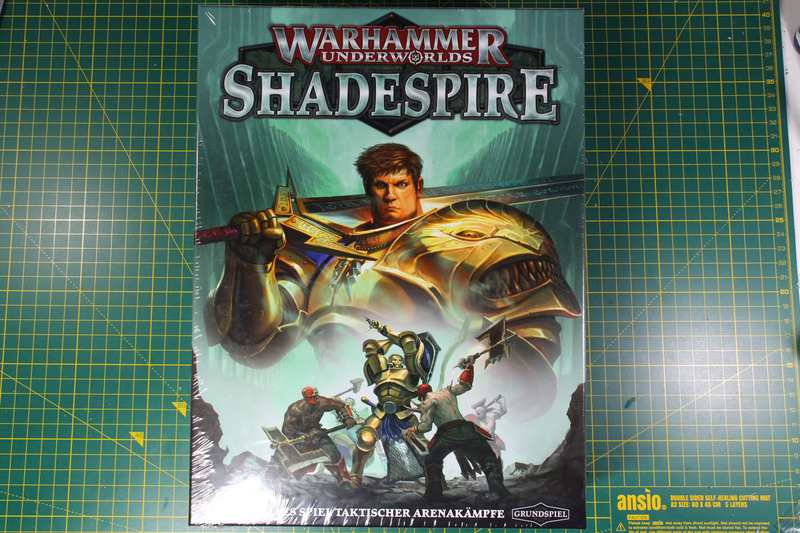 So if you're a / the wargaming evangelist in your gaming group, it might be helpful to have a copy of Shadespire around, to get new players into the miniature hobby. 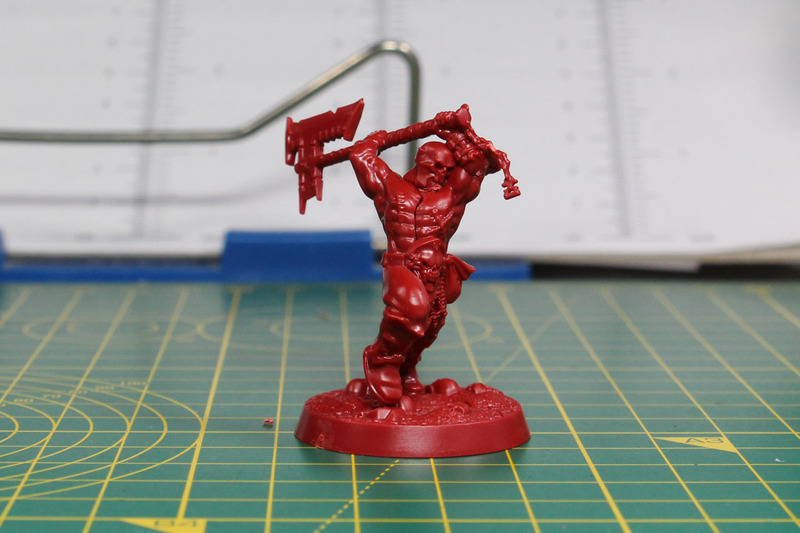 As a fulltime working family man, Shadespire appeals to me for multiple reasons. It does not need a lot of space, I can easily play it on the kitchen or dinner table. If you only have little time to spare, like half to up an hour an evening or a bi-weekly gaming night, it works quite well. 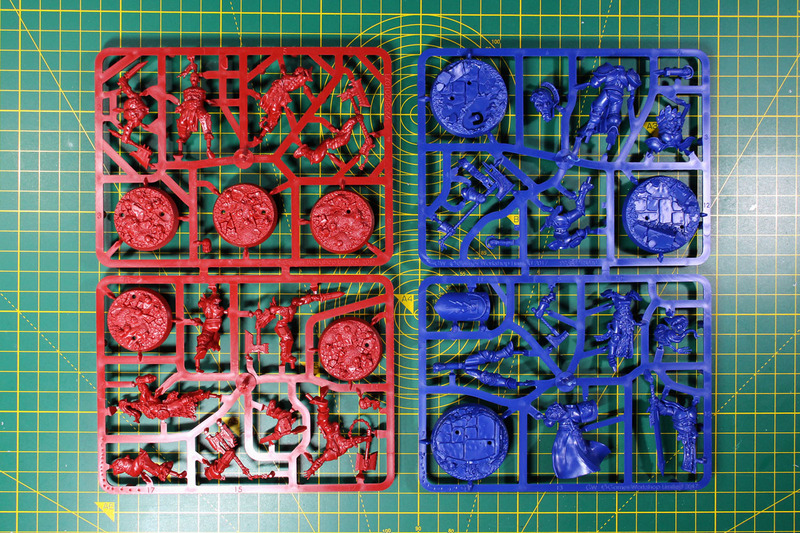 It does not need a lot of miniatures, so storing and getting them painted is not a big issue. It is travel sized, it doesn't need a terrain collection etc. 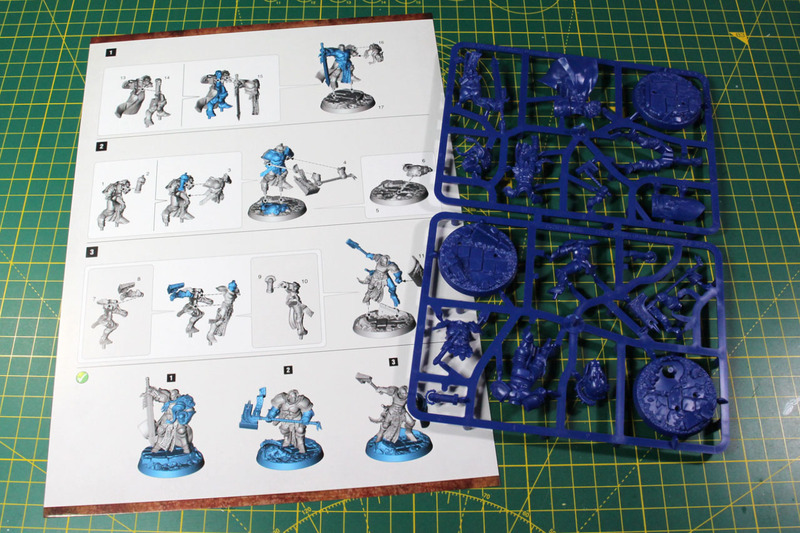 And if you're on a budget, you get a full warband of Citadel miniatures at a low cost.